Hello again! Glad to see you've come back for Day 2 of TCM previews! As you might have guessed, I've stuck with many of the same products for this card as the one yesterday. If you know me, you know that I love to create card sets and love how easy they are to pull together because all of your colors are tried and true and pretty much fool-proof. Not to mention that when you are creating with limited time, it is a huge life-saver! So let's move onto today's card featuring the 'Owl See You in the Spring' set by Jenny Suchin, an incredibly talented artist whose stamps always put a huge smile on my face! I love all the cute images in this set, and I especially loved the adorable chickadee in the half-cracked shell. 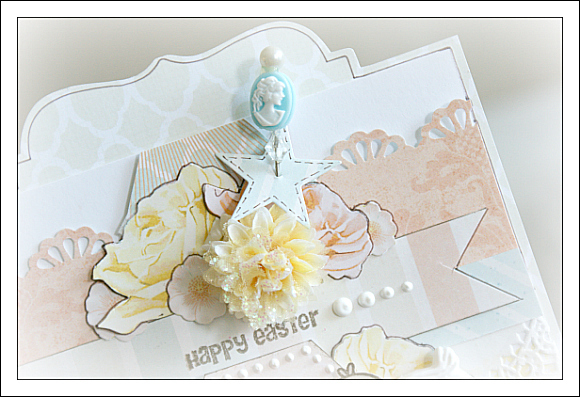 I used a the same My Mind's Eye papers in for this card, from the Follow Your Heart and Miss Caroline collections. I seriously cannot get enough of this paper. Okay back to my card and to the stamps...I stamped the darlin little chick onto some subtle pattern paper and cut it out...My Honey-Bees also got a good workout cutting out all the lovely roses and the other shapes on this card. There I go again, getting off track...Back to the card. I also added a pretty Gillian rose by Prima, and some liquid pearls here and there. I couldn't resist my Prima sugarplum flowers (from way back when) a soft yellow button from Fancy Pants Summer's End collection, and another awesome resin flourish from my friend, Cayla! And of course, what is a card without a little bit of liquid pearls? So I've added a few here and there! Thanks for joining me again and I hope to see you here tomorrow for Day 3! oh so pretty...I always love your use of the soft palette of colors...gorgeous. 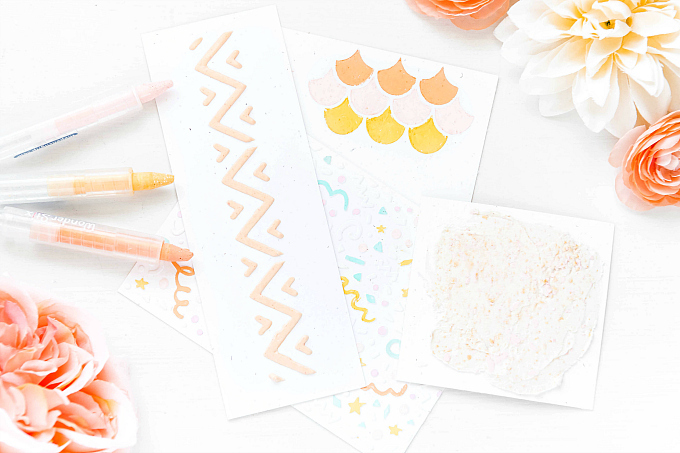 How cute is your blog, your cards are so lovely. I like how your shy chickie is peeking out from the flowers. Darling. The sofy, subtle colors really makes me think of Easter dresses when I was a child. Beautiful card Ivana!! I love the soft colors and all the details! This is gorgeous as usual! Love the flowers and that little bit of doily peeking out. The little chick is so sweet! so elegant. love all the special little details. So elegant and feminine! Beautiful! Your cards are always so beautiful Ivana! absolutely gorgeous and love the soft tones and textures you chose! 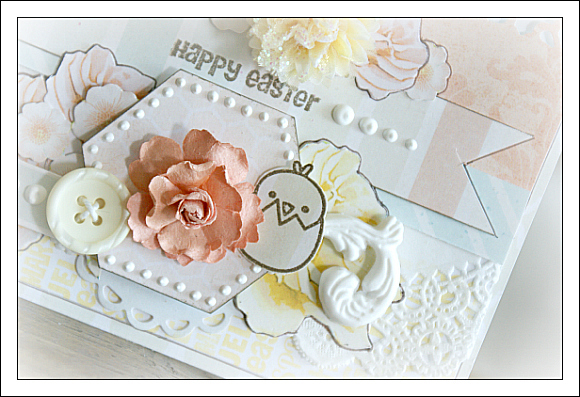 Very sweet card, looks just like Easter with the soft "ice cream" colours. As always your work is delightful and inspiring! Wow, love the soft colors here and all those embellies. This is gorgeous!! Gorgeous card. 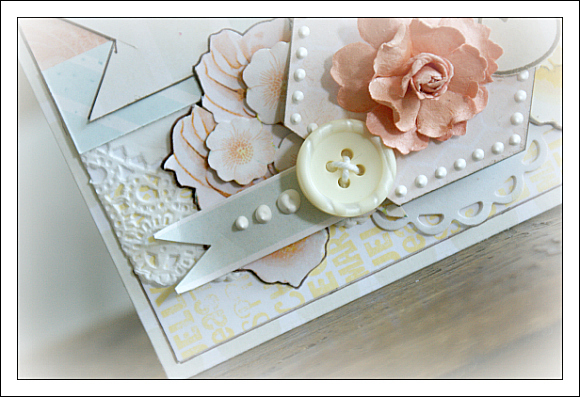 Love all the layers and details you included in your card. Love your beautiful cards. They are so soft! Would love to win! I follow you on Pinterest too! Awesome card. So nice to see Spring-y colors. wow.. gorgeous.. love how you used the stamps! Just gorgeous! Who knew a cute set could be used for something so elegant! oh my, look what you did with the li' chick! So, so nice! beautiful! love the softness of your card. so feminine! 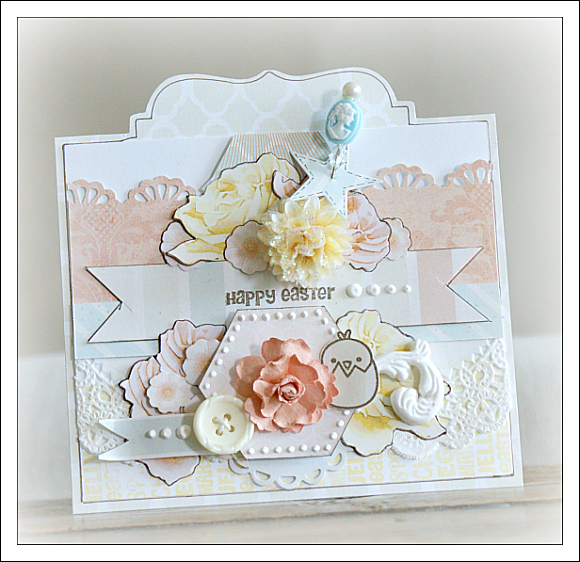 such a gorgeous card...love the soft colors you have used! !